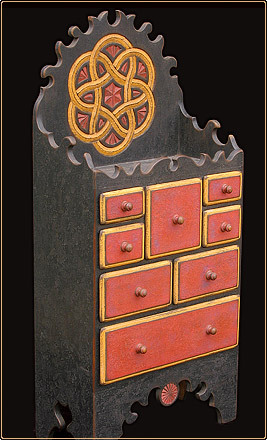 This one-of-a-kind, carved and painted pine eight drawer spice cabinet is my tribute to the ones used when herbs and spices did not come in sealed containers from the supermarket. It can be free standing or hung on a wall. Whatever it holds, my hope is that it will become a cherished heirloom for some family.